After the Porcupine River drainage, the Tanana River drainage is the second largest tributary system of the Yukon River. The Tanana River basin drains an area of approximately 45,918 square miles (73,898 km2). The mainstem Tanana River is a large glacial system formed by the confluence of the Chisana and Nabesna rivers near Tok and the Alaska–Canada border, which flows in a generally northwest direction for some 570 river miles to the Yukon River. Much of the human population in Region III is located within the Tanana River drainage along the Alaska, Richardson, and Parks highways, and along the road system around Fairbanks. 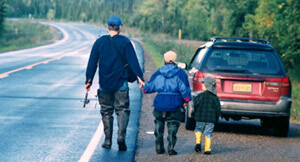 These highways and their secondary roads provide much of the access to sport fisheries. The Fairbanks North Star Borough and part of the Denali Borough lie within the Tanana River Management Area (TRMA). Approximately 99,000 people live in this area. The TRMA affords highly varied fishing opportunities ranging from lake trout and Dolly Varden in the high elevation lakes along the Denali Highway to some of the highest quality Arctic grayling and coho (silver) salmon fisheries in the clear spring fed rivers within Interior Alaska.